Ten Signs that You are a Catholic of "A Certain Age"
1. 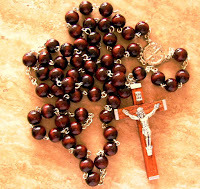 While saying the Rosary, your mind wanders and you get mixed up counting the prayers on the beads. You say an extra Hail Mary at the end of the decade, just to make sure you got all ten of them in. 2. You once told a priest what you thought was a pretty big sin in the confessional and were both relieved and surprised when he only gave you a penance of five Our Fathers and didn’t tell you that you were going to burn in hell for what you did, which is what your mother said when she caught you at it. 3. You still have your old First Communion picture but you never show it to anyone because people laugh at it. 5. You bring your dog to the blessing of the animals on the Feast of St. Francis of Assisi and pray that he'll behave (the dog, not St. Francis).